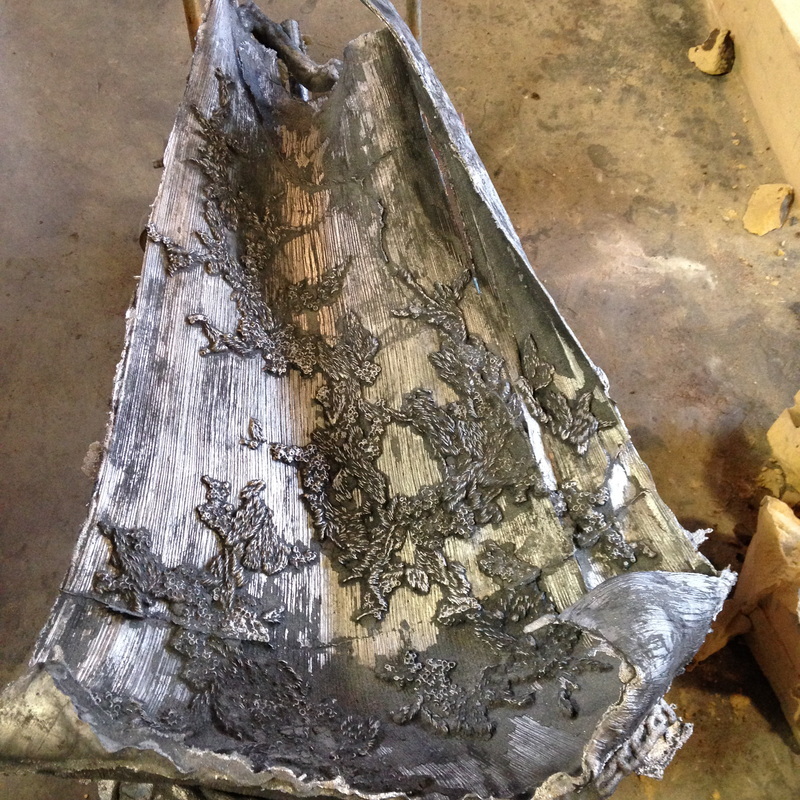 The cast metal process is extensive. There are many different steps to the process. 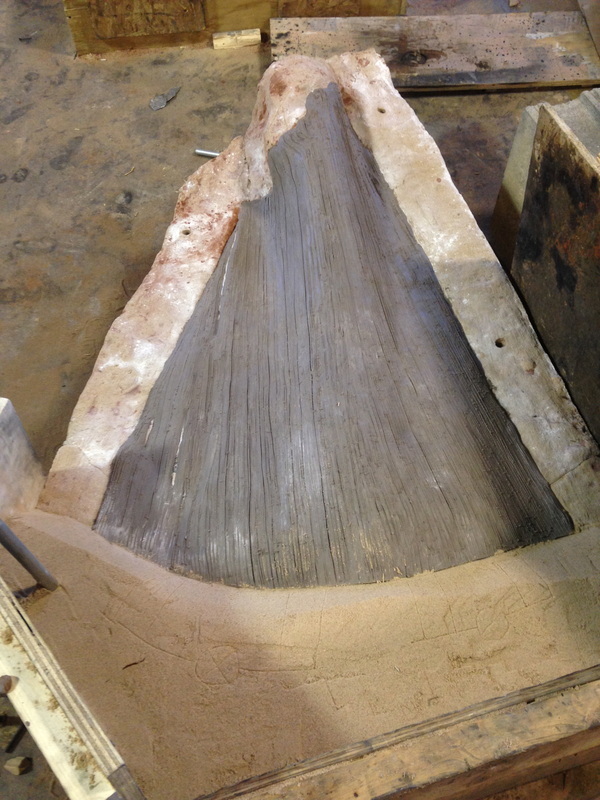 Below are pictures of the modern cast metal mold-making process, illustrating how I made Palm (2014). First we start with the "pattern." 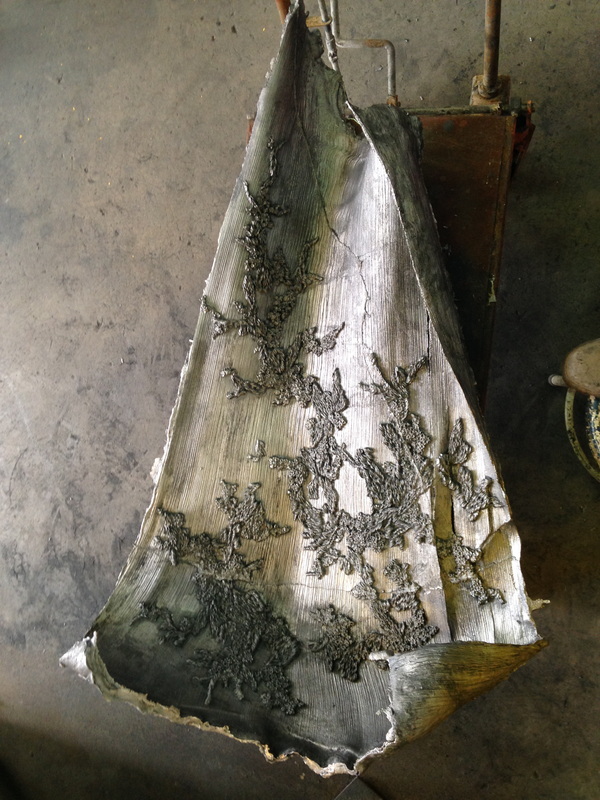 The pattern is the object that is desired in metal. 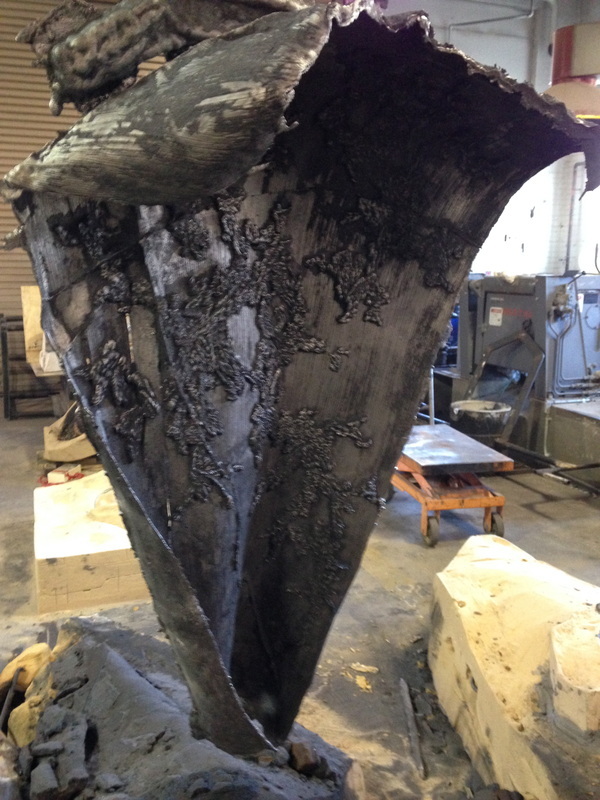 Whatever the object looks like, the finished casting will look like. Here, I have a piece of palm tree bark with added wax texture. We laid the pattern down and built wooden walls, called a "flask," around the pattern. 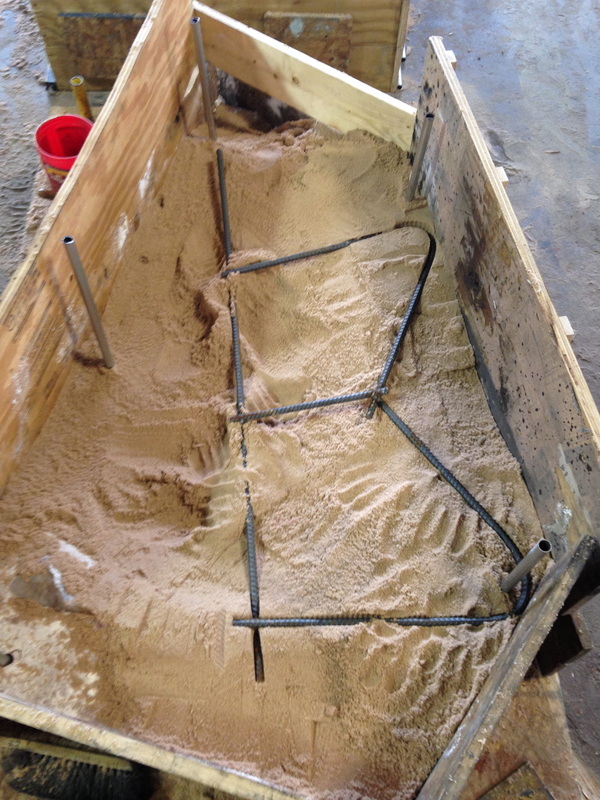 Here we see the beginning of the sand mold. 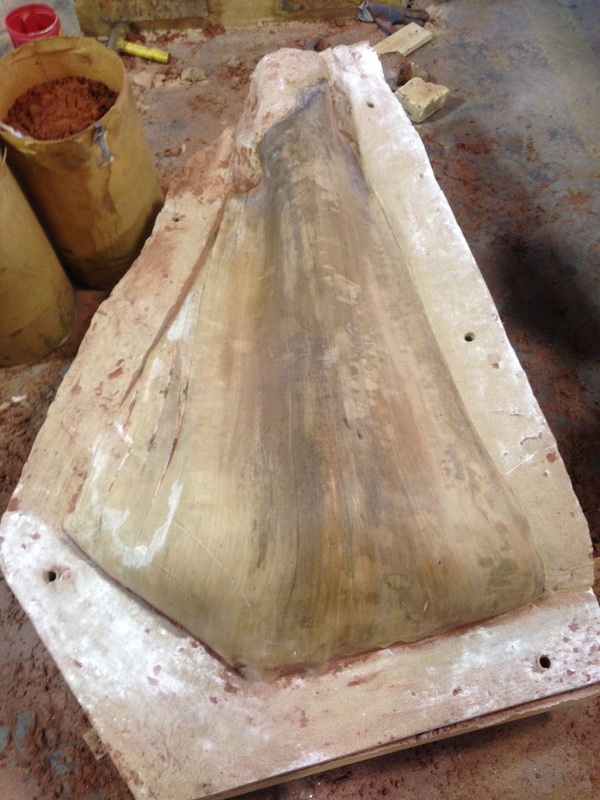 Since the piece of palm tree bark curled over itself, multiple parts were needed to complete the mold. Here are the first two parts of the mold. 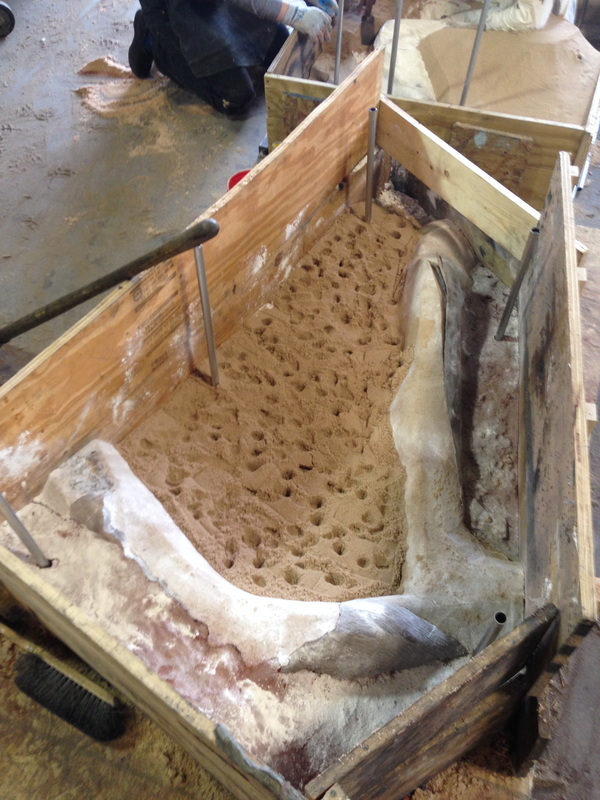 Each piece of the mold is made with a resin-bonded sand. 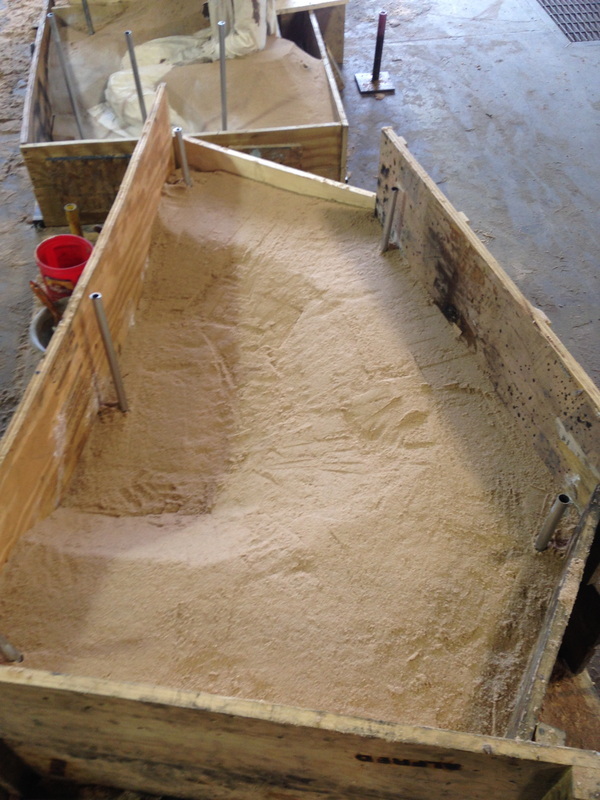 In a large mixer, the three-part resin and the sand are mixed together. 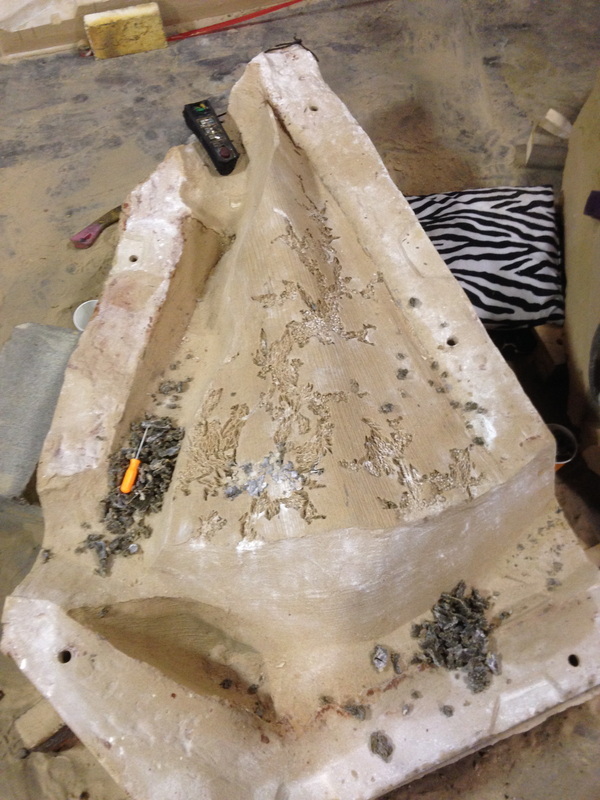 Once completely mixed, we take the sand out of the mixer and push it up against the pattern. This process is called "ramming." Ramming must be done firmly to make sure the pattern leaves an impression in the sand. 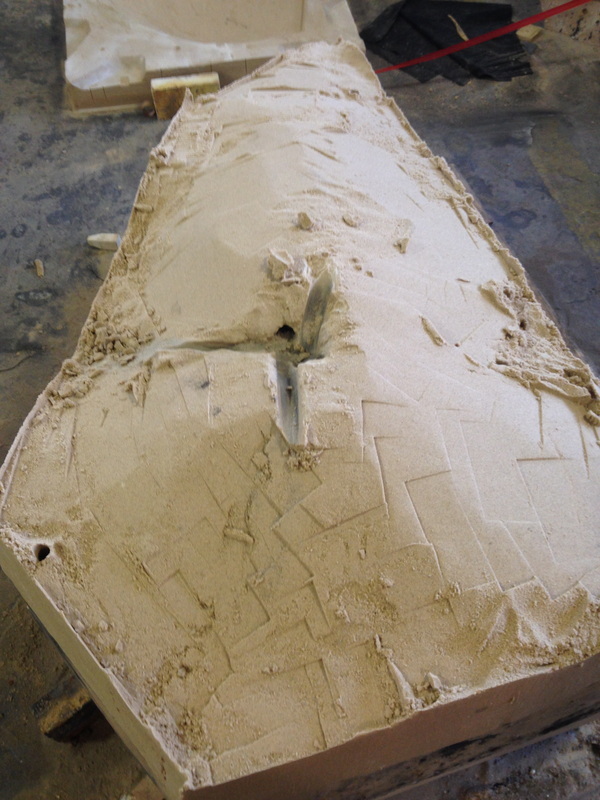 The resin sand sets up over time until it is extremely hard. 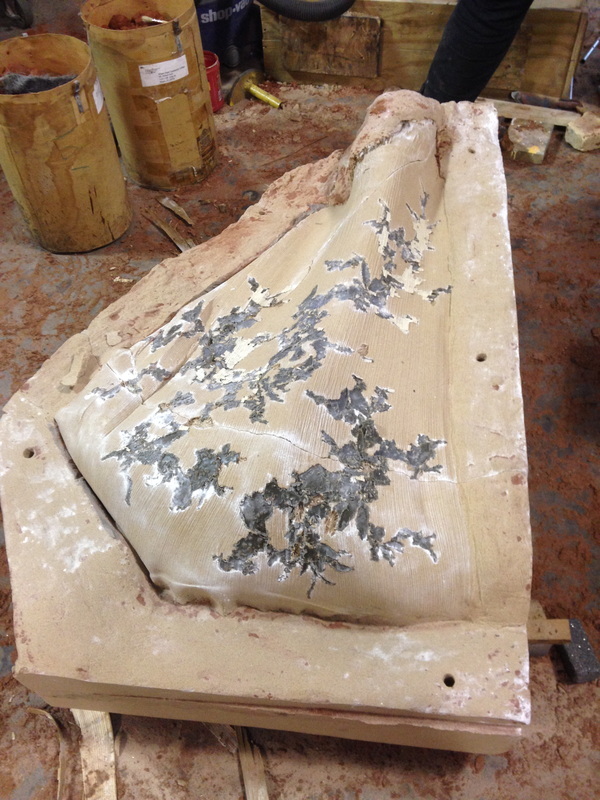 The next step is to finish ramming this side of the mold. The mixer mixes sand in batches. This is about two batches worth of sand. 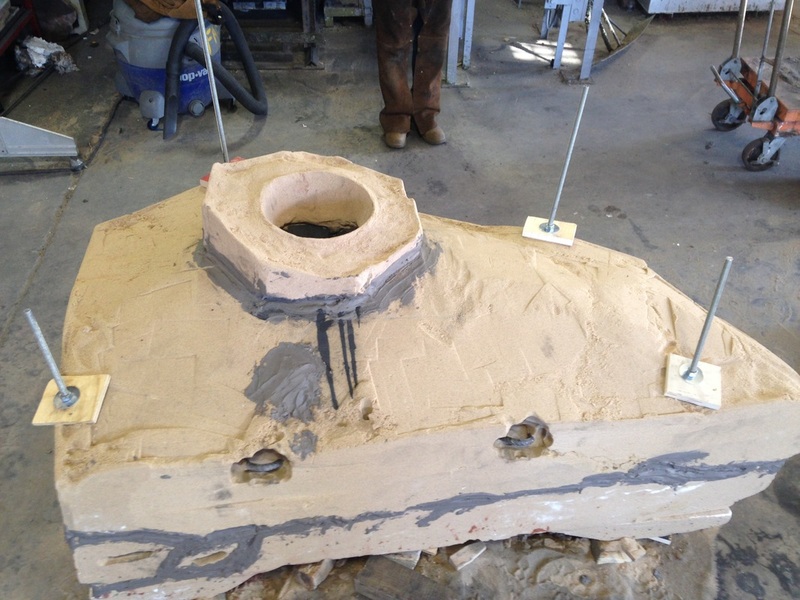 For large molds, an inner metal structure may be needed so we can attach the mold to a crane to move it. 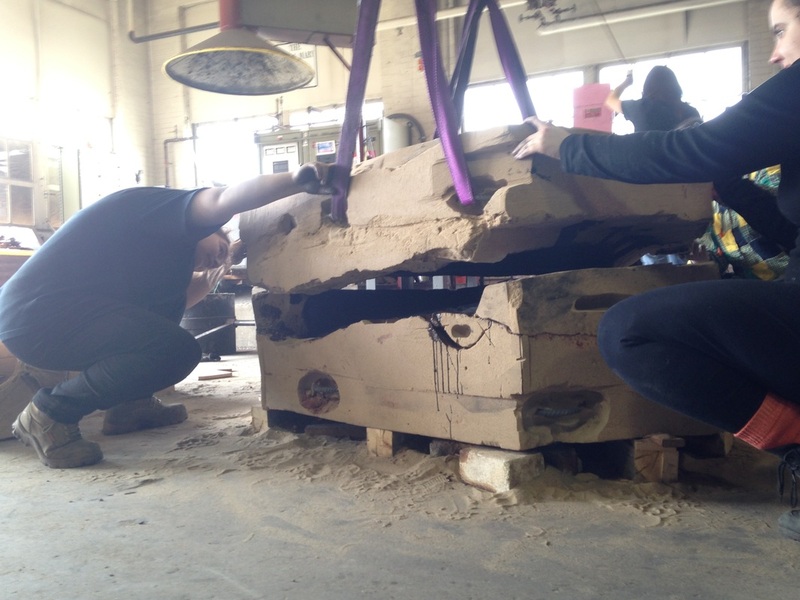 We weld together pieces of rebar to create this inner metal structure. Finally the first half of the pattern has been completely rammed. Now it's time to flip the mold over so we can ram the other side of the pattern. 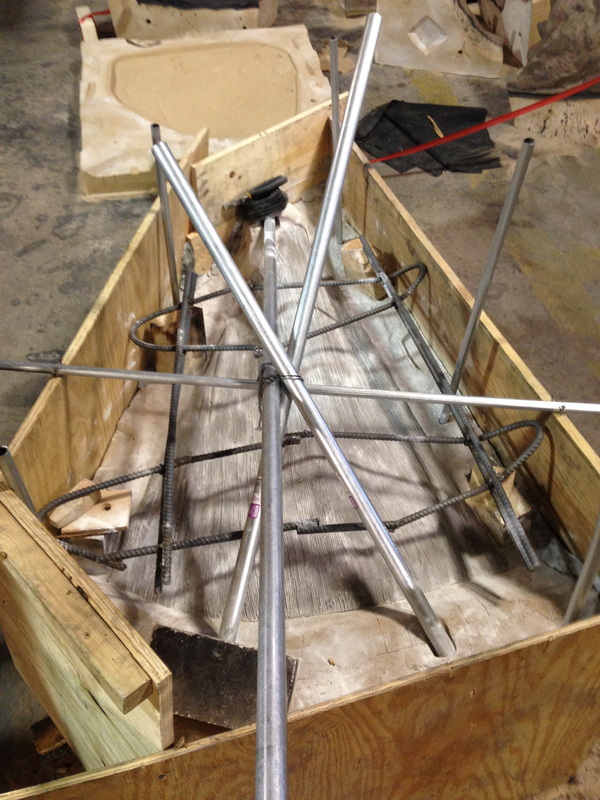 Using the inner metal structure, we strap the mold and lift it with the crane. 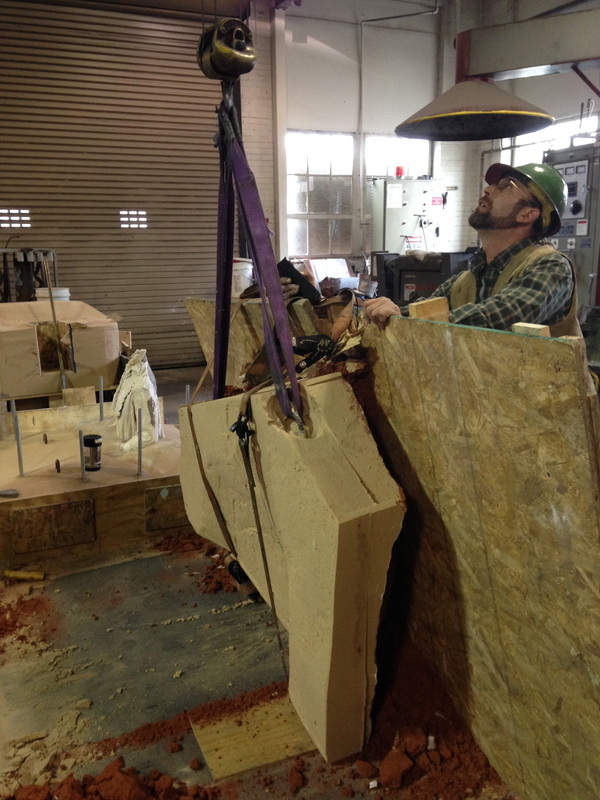 Once flipped we make sure the mold is stable by adding blocks underneath it. 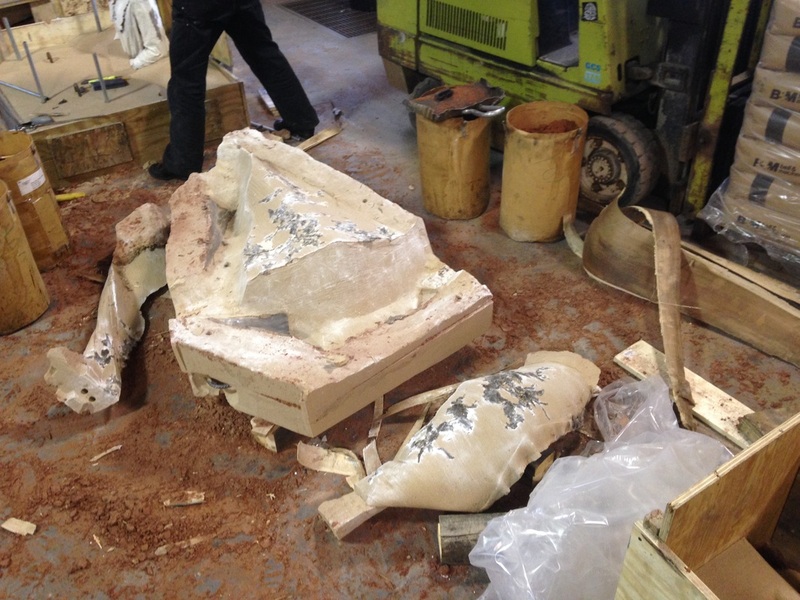 The mold is then taken apart to check if the pieces come apart easily. 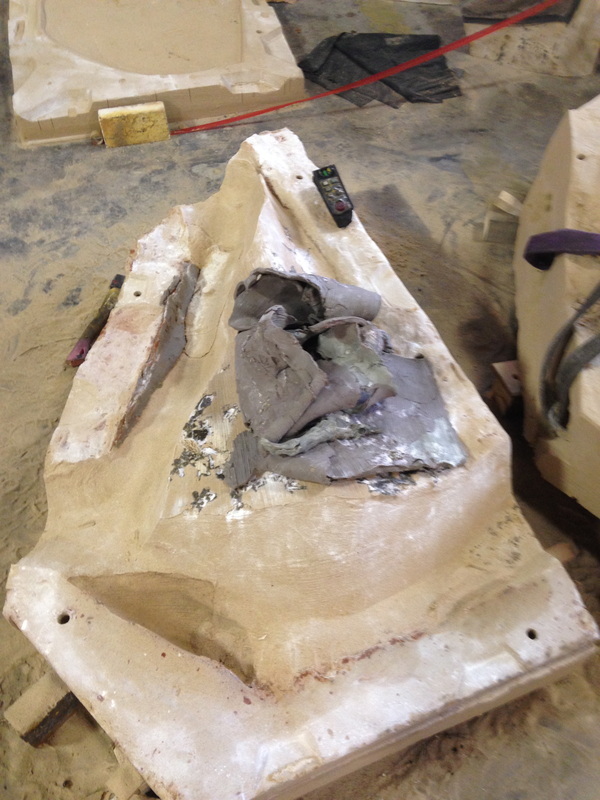 The mold is then put back together. The next step is to apply a layer of clay that is exactly 1/4" thick and recreate the texture of the original pattern. The entire piece must be at least 1/4" thick so the metal flows through the entire piece without chilling. At the bottom we see another part of the mold has been rammed. It is now time to add the "gating system." The gating system is the combination of channels that connect together, forming a pathway for the metal to flow into the pattern. In this instance, I used pipes to create most of the gating system. On smaller pieces these can be added later by drilling into the mold halves once they are set up. 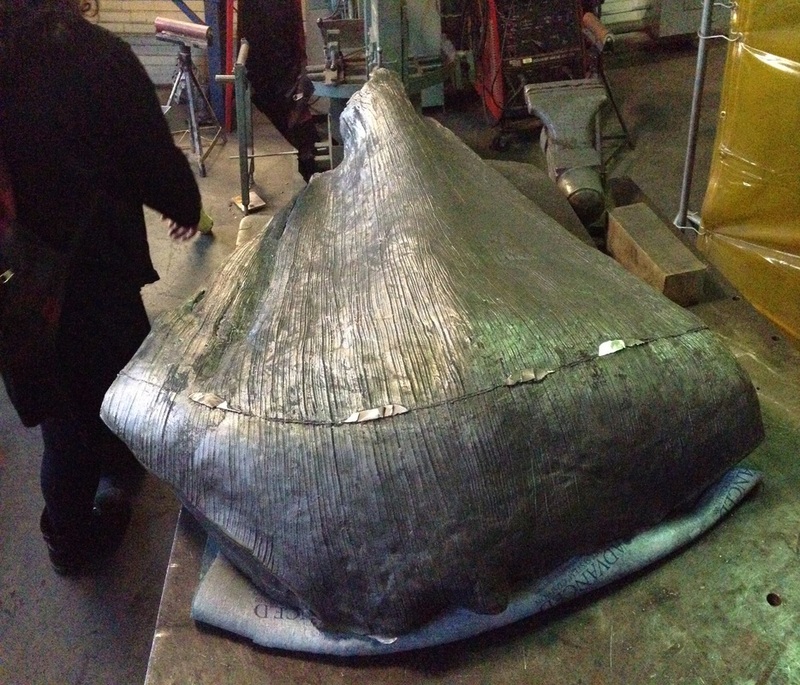 I also have another inner metal structure propped up in the mold. The mold has now been completely rammed. 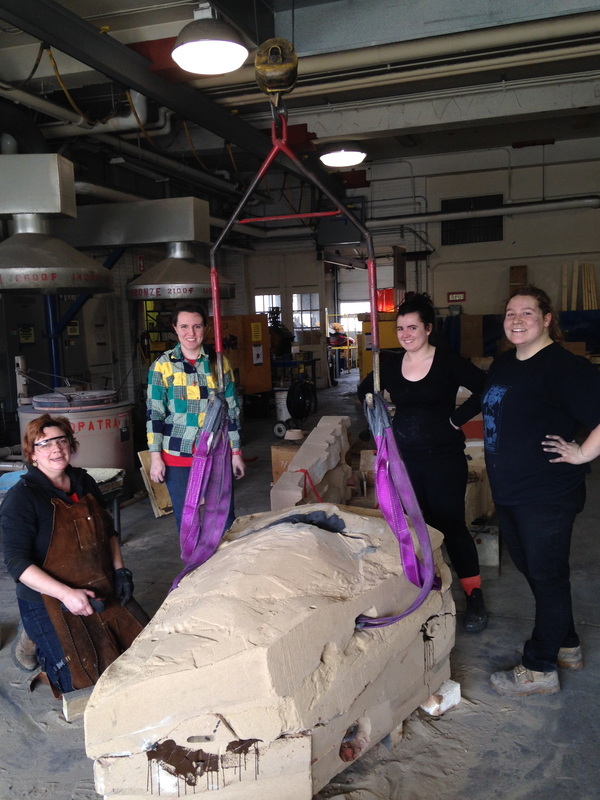 Total mold weight: 1.025 tons of sand. Now we remove the metal poles. Time for the mold to get a bit of clean up before we open it once more. 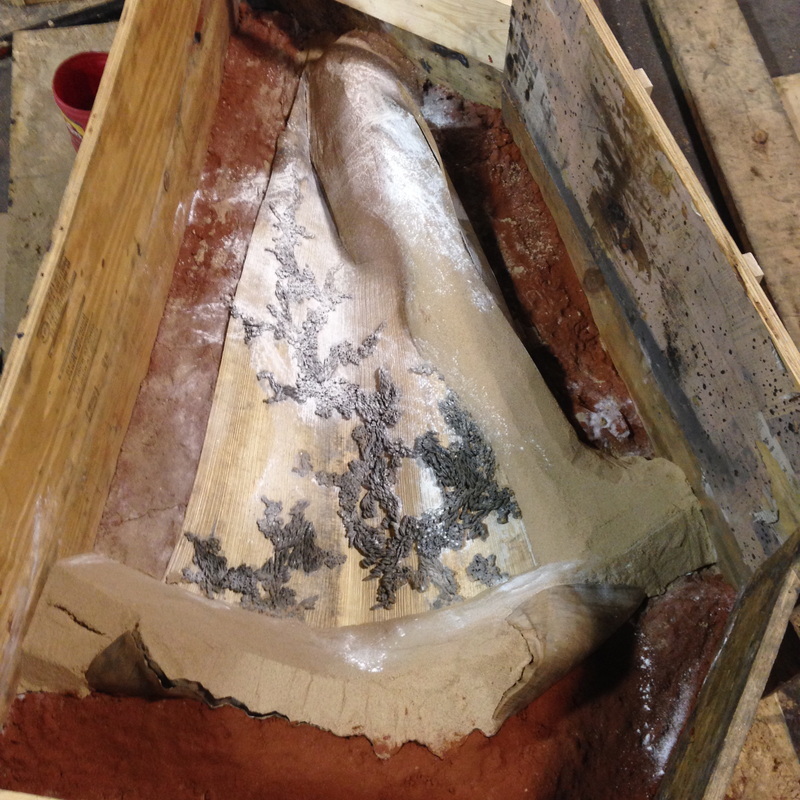 Once open, the layer of clay needs to be removed from the mold. The six parts of the mold. The wax also needs to be removed. Next the pattern needs to be covered in a solution called "mold wash." Mold wash is a mixture of powdered graphite and denatured alcohol. 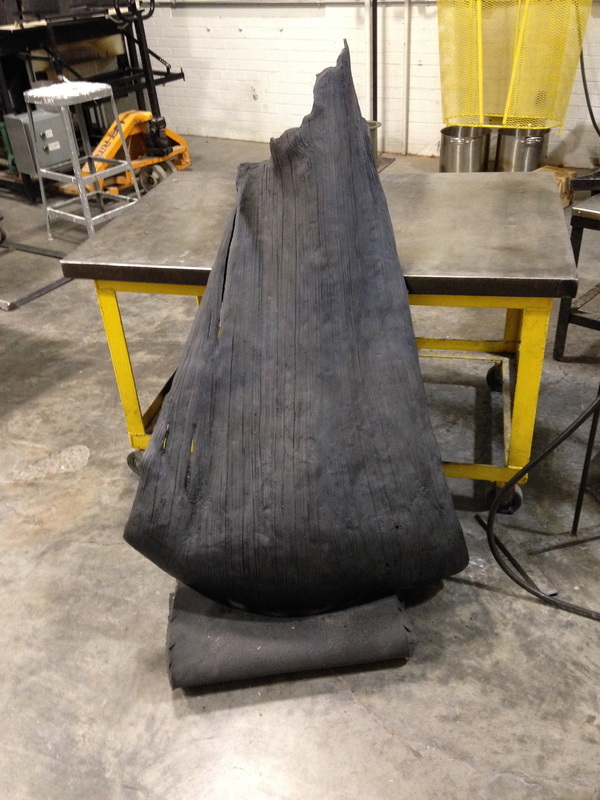 We add this to the pattern to prevent "burn in," or when the sand sticks to the metal casting, creating an ugly sand texture on the surface of the piece. 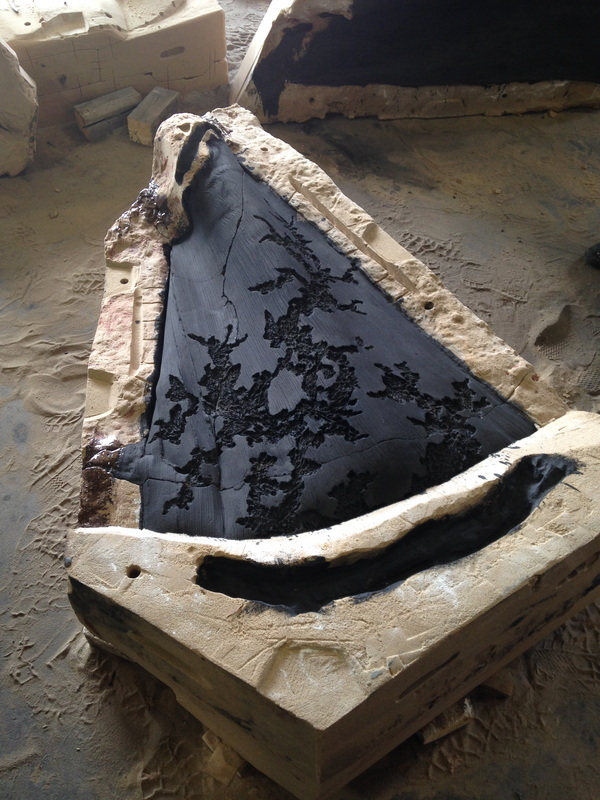 The small particles of graphite in the mold wash fill the gaps left between particles of sand, ensuring a smoother surface. We use the crane to put the pieces back together. 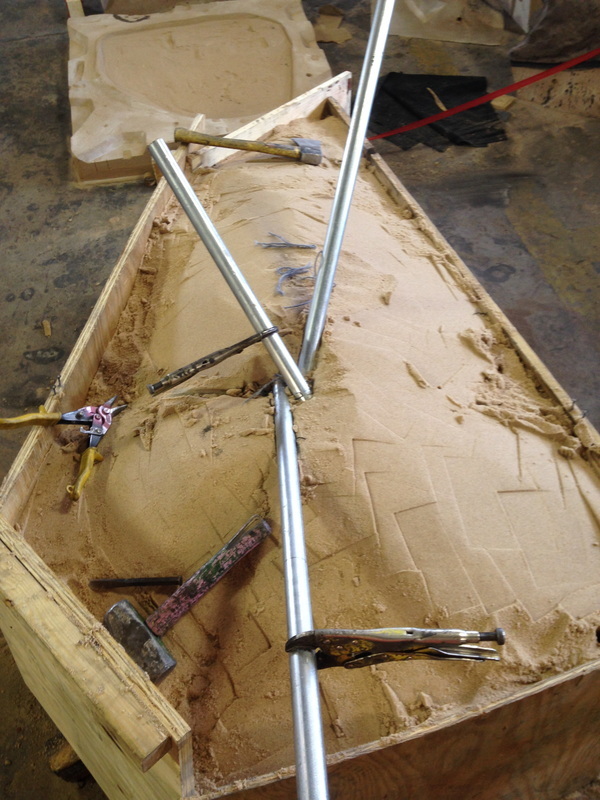 The last step before pouring the mold is bolting it together and sealing any cracks or spaces between the mold pieces using "mold patch." 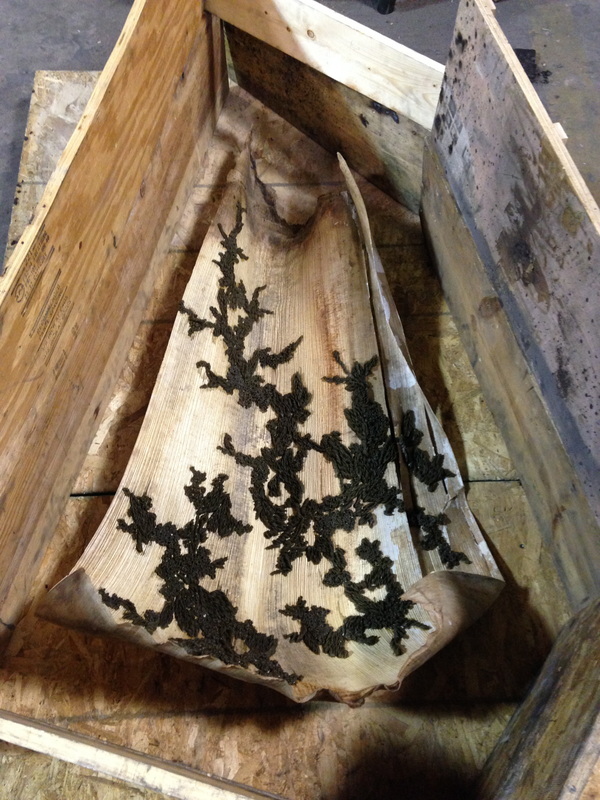 Mold patch is a type of glue that is especially for foundry use. 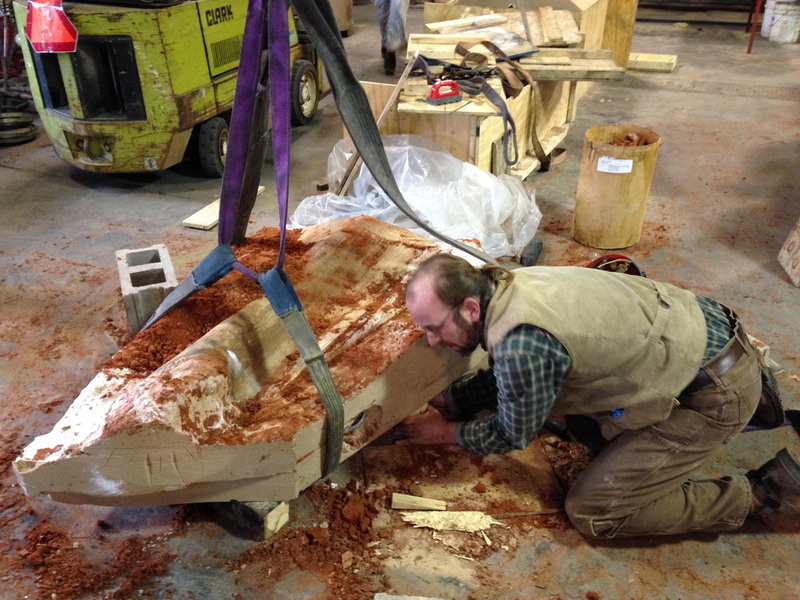 Once poured, the mold needs to be cooled. 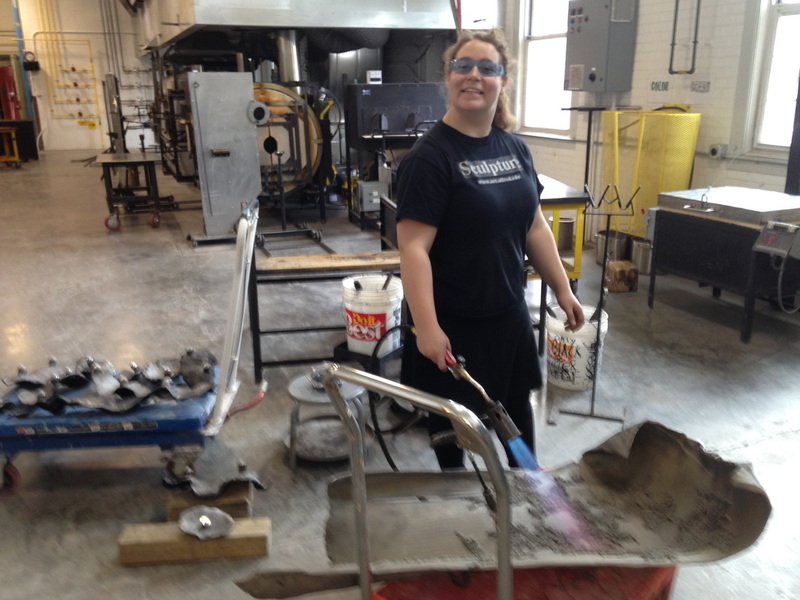 I waited 24 hours before breaking open my mold and the metal casting was still too hot to touch without gloves! 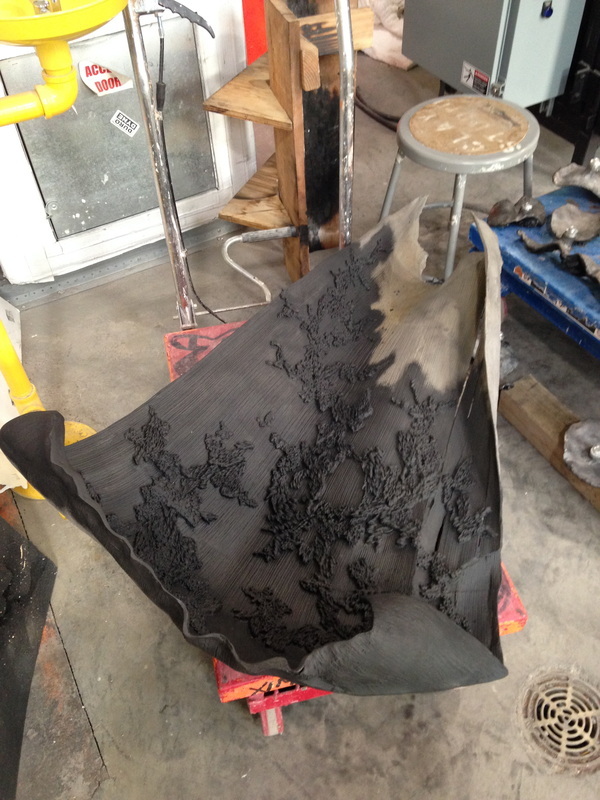 Here is a view of the chaos of breaking open a mold. 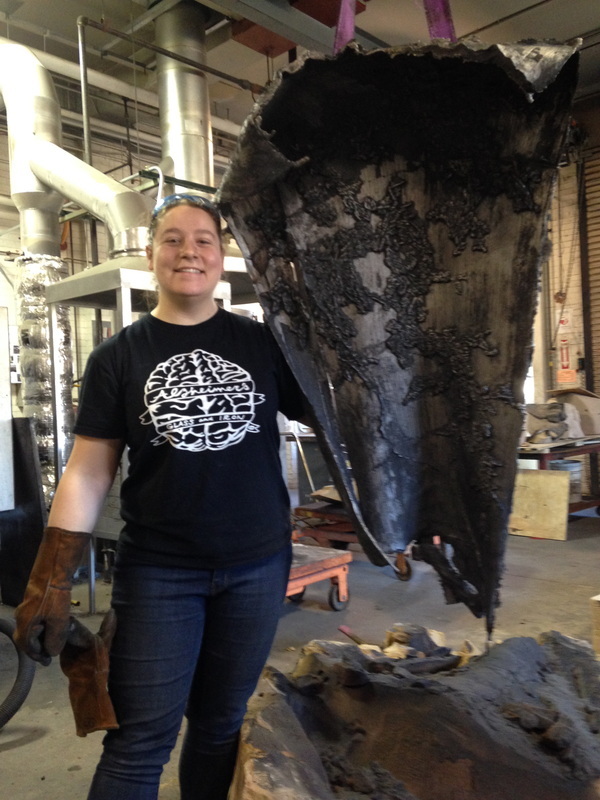 Me and the casting fresh out of the mold. It still needs so much work before it's finished! An almost perfect casting! There are no miscasts or areas of shrinkage! The next images are of the finishing process. First all the sand needs to be removed from the piece. Then the edges of the piece need to be ground down and smoothed out. Also, the lines, where the mold pieces fit together, need to be smoothed out as well. 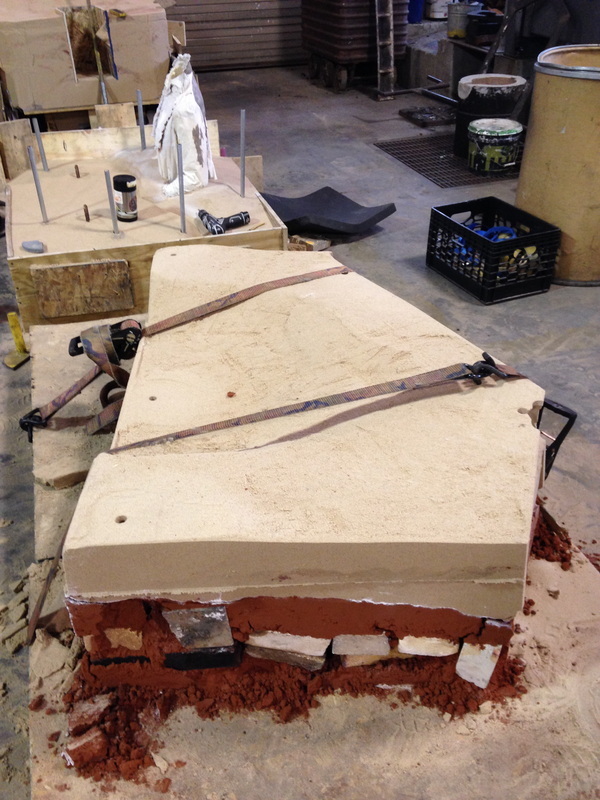 On the reverse, the line from where the two mold pieces fit together needs to be ground down and evened out. Once all the metal grinding is done, it's time to seal the piece with wax. 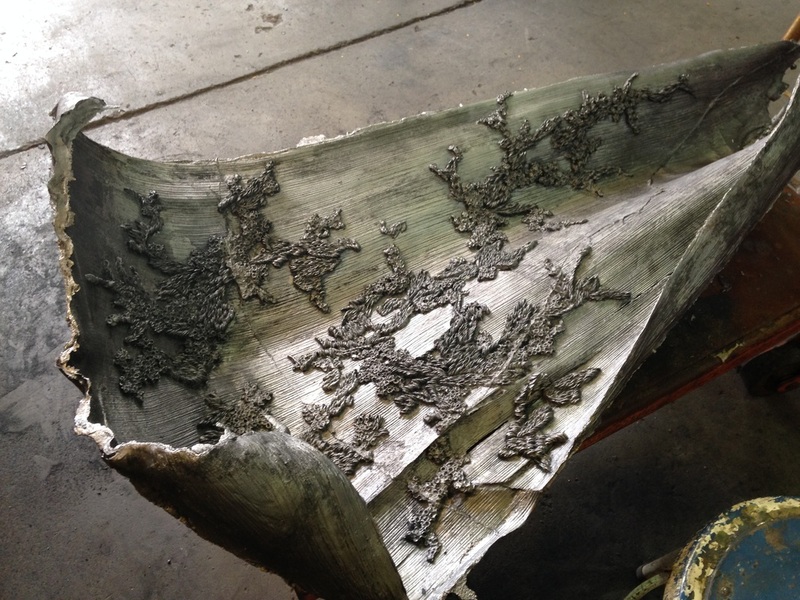 Iron rusts over time, so by sealing it with wax, it helps prevent rusting. Using a propane torch, I heat the metal up evenly and start adding the wax. The color difference here is very drastic because I added some graphite powder to my sealing wax. The back is also complete! 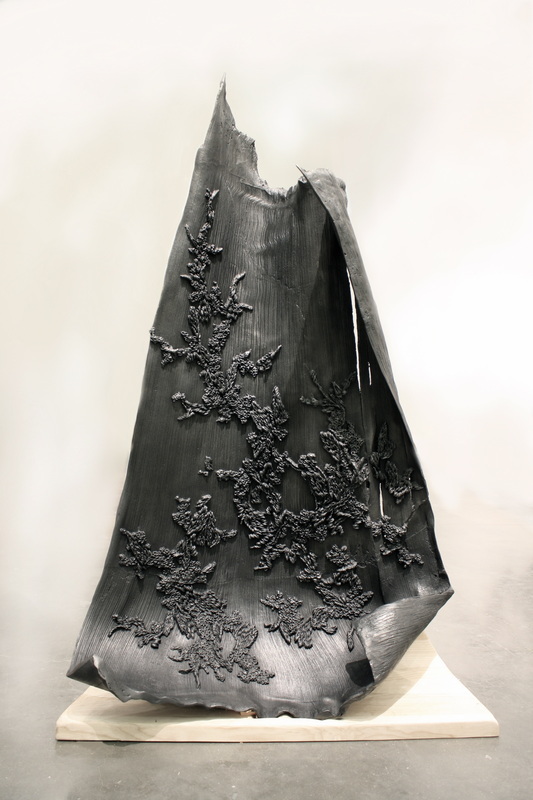 And here is the finished piece, Palm (2014). To get the gentle shine, I wire brushed the surface of the piece. Because there was graphite mixed into the wax, the piece shone back up easily.